HAPPY NEW YEAR! Hope your 2011 is as wonderful, fulfilling and filled with lots of crafty days! 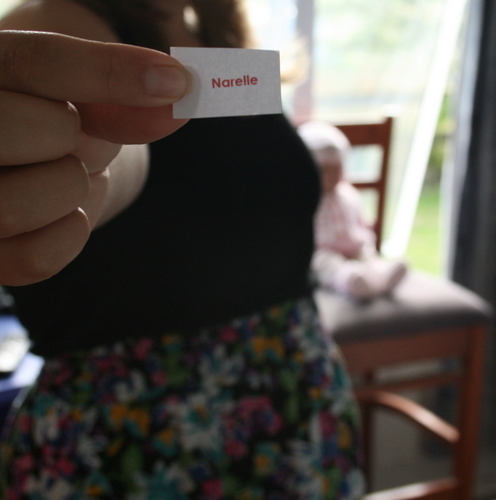 Congratulations Narelle!! Ill be emailing you to get your address so I can send your bag off! Glimmermist, chipboard, primo (you know the one) stuff. So leave me a comment by Midnight tonight. Only NZ residents are eligible for the draw sorry! 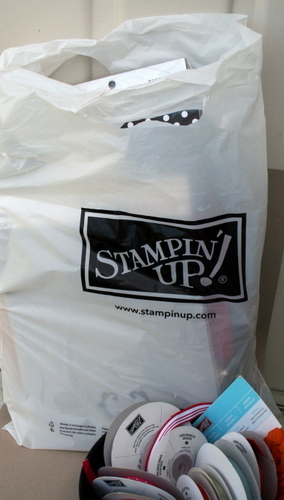 Because of Stampin’ Up! rules I cannot show you the other manufacturers items that Im giving away so to get around that ..each bag or box will be a mystery until you get it. 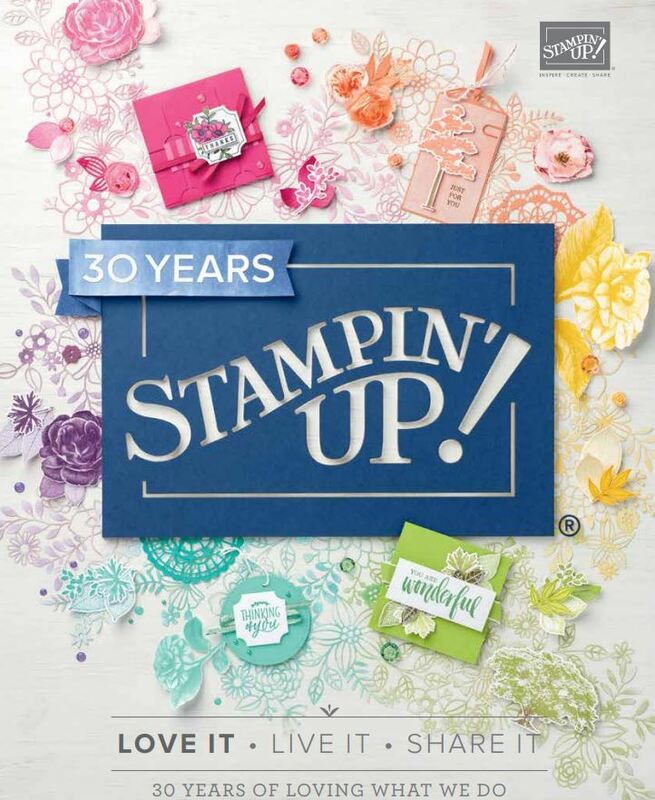 I can show you any Stampin’ Up! product that has retired though. Believe me when I say you will LOVE whats in the bag or box ..and if you dont…pass it along to someone who does. and what Ive been up to today and yesterday? (well apart from milking the cows), Ive been doing up these for an upcoming Berry festival in Whakatane (next Saturday) in the the main street. Ive filled 50 so far and I dont want to see another pebble! 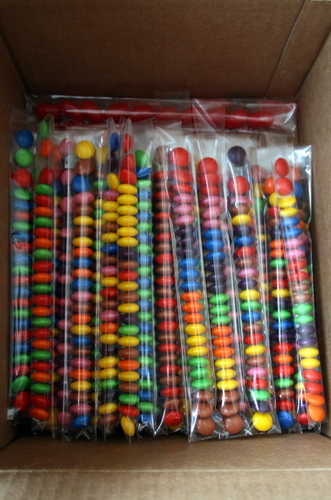 So ill be starting on the red jellybeans and berry lollies today. I still have to decorate them too. Last chance! Thanks for the opportunities I bet the winners are thrilled with their goodies. I’ll take this opportunity to wish you a Happy 2011. Awesome idea for pebbles and jellybeans. Coloured patterns as well. Happy New Year to all. On go slow today. Thanks for the chance of goodies. Looking forward to more interesting and exciting new ideas. Last super duper bag, fantastic. Anyone want to sell me some????? Hope you had a great night. Happy New Year! love the skinny bags – where did you get them from? Happy New Year Delys!!! Lets hope we can catch up for a play soon!!! I love the look of that ba..I can see the black and white dot packaging!!. I am uploading a summer page on just add ink too! Hi, love the pebbles they look fantastic. Hope your having a lovely New Year. Wow you have been busy filling all those bags, all the best with the decorating of them. Happy New Year to you and your family. Wow final day of giveaways. How kind it has been for 7 days that you have taken the time to giveaway some packs that look pretty amazing. Just wondering on your last photo today about the pebbles etc where do you buy the bag things. I have seen everyone using them but havent had a clue where to get them. Happy New Year to you 🙂 Love those pebbles!! Those bags of lollies look so cool! I’m sure they’ll sell well at the festival. Happy New Year Delys … and yep, those bags are gonna be mega popular when they get to NZ … so very cool! Happy New Year Delys. I look forward to seeing more of your creativity. All the best for 2011 to you and your family. Many thanks for your huge generosity over the past 7 days. How exciting and thank you so much. Have a great new year, I personally couldn’t ask for a better start with the good luck on your blog. Love the pebbles in the skinny bags, so colourful. Hey Delys, Happy New Year to you and your family. Looks like you are starting 2011 just as busy as you were last year. The giveaway goodies look very exciting. happy New year to you too Sally! Happy New Year Dely’s to you and your family, Thanks for the chance to win some of your stuff it all looked exciting. The pebbles look yum and very colourful by the way. Had our 33rd Wedding anniversary New Years Eve we had a great day and a Merry night and Bruce took me for a ride on his Triumph today and we ended up at the craft market nice stuff but not as good as yours. Have a great 2011 you are sure one busy lady. Happy New Year. Love the idea of cleaning out and starting the new year with a new stash of goodies. What’s the berry festival about? Its a market day on the main street of Whakatane Nicki!